Once upon a time, Nick and Amy were happy. or at least they seemed to be. By the time they both lost their jobs and left Manhattan to move to Nick’s hometown of North Carthage, Missouri and take care of his ailing mother, that happiness was gone. There were a couple good years, but half of their five year marriage has been more or less miserable. Then, early afternoon on their fifth anniversary Nick gets a call from a neighbor that his front door is sitting wide open. When Nick returns home, he finds his wife missing and signs of a struggle. Amy is just…gone. There is not much that can be said about Gillian Flynn’s Gone Girl without spoiling it, but it is an incredibly engaging roller coaster of a book. Flynn has written a book full of twists, turns, and suspicious behavior. Nick and Amy both have secrets, and the reader can never quite completely figure out what is happening, and even if you do happen to guess correctly, motivations will still shock. 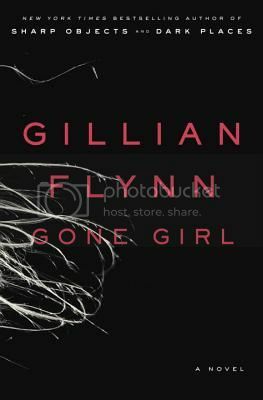 Gone Girl is deliciously twisted, and I can’t wait to explore Gillian Flynn’s backlist. Highly recommended. Well done! You managed to encapsulate what the book is about without spoiling it, and if I hadn’t read it already, I’d be on my way to pick up a copy. Sounds like a good summer read. I had this one on my list; glad to know it’s worth the read. I just finished my first Gillian Flynn (SHARP OBJECTS) and as soon as I’m over the trauma of that, I’m definitely looking for this one! Ha! I know what you mean. I want to read her backlist, but I definitely can’t go on a Gillian Flynn binge..
I’ve got her first book in my audio line up, maybe later this month, depends on my pacing. I think I’ll like her style. Your review certainly has me wanting more!! I just ordered this one – can’t wait! Yes – she is a master of deliciously twisted. I haven’t read this one yet, but I’ve got it. Loved Sharp Objects. Dark Places was good too, but I liked Sharp Objects better. This one’s already on my to-read list, and you’ve just reinforced the though that I need to pick it up soon. I loved this book, too! I’d also recommend her debut Sharp Objects, that was just twisted! I LOVED this book. I saw Gillian speak last week and from what she said her two previous books are equally twisted and also have strong female main characters. I want to read them soon. She also said that she doesn’t plan the twists and turns, she just writes and sees where the story goes. Can you imagine? I really cannot imagine that! I can’t believe how well stuff turned out without planning! There’s a lot of good buzz happening about this book right now. It sounds very compelling and fascinating.